Start is a new initiative by HRH The Prince of Wales’ Prince’s Charities Foundation to help people live more sustainably. One of the ways they are doing this is with A Garden Party to Make a Difference which is being held from 8th to 19th September. Featuring fashion, food, entertainment, concerts, home and garden displays, celebrity gardeners , chefs and media personalities, the garden party showcases the latest in sustainable living with displays, shows, debates, presentations, a farmer’s market, fashion workshops and lots more. My family and I went along on Sunday and there certainly was lots to see and do, all set against the incredibly historic backdrop of Clarence House (official residence of HRH The Prince of Wales and HRH The Duchess of Cornwall and previously home of the late Queen Mother), St James Palace (dating back to Henry VIII), Marlborough House (headquarters of the Commonwealth Secretariat), Lancaster House (originally commissioned by the Grand Old Duke of York in 1825), Friary Court (from whose balcony the ascension of a monarch is proclaimed), the Queen’s Chapel and The Mall (the long boulevard leading from Trafalgar Square to Buckingham Palace). I was particularly taken by the pallet house in the photo above, which can be assembled using only hand tools within the space of about a week. It turns out that 84% of the world’s refugees could be housed with just one year’s supply of recycled American pallets. Okay, it wasn’t a palace, but in terms of basic shelter it was quite seriously cool. I also really loved the Gravel Garden in this photo. Designed by Beth Chatto, it is designed with plants that are drought resistant as well as beautiful, and the plants we saw on Sunday have never been watered by anything other than rain. Not surprisingly, it was the gardens that interested me most. And the gardens designed by The One Pot Pledge were quite simply amazing. 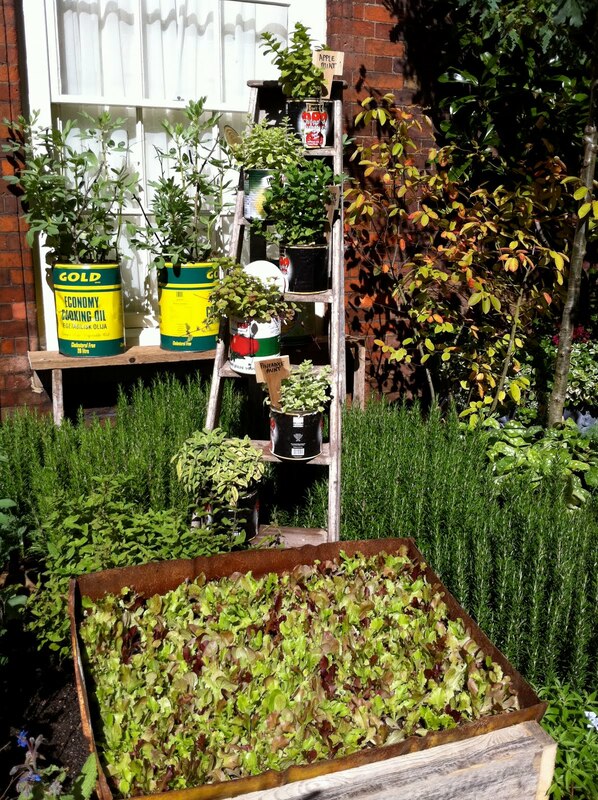 They conclusively proved that you really do not need a big garden to grow vegetables. I loved the creative use of castaway furniture, cleaned paint cans and even rain gutters (eavestroughs) as growing places for fruit and vegetables. 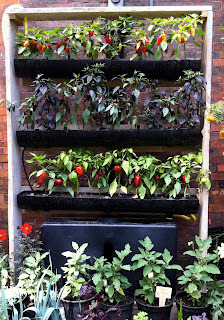 And if you do have a bit more space, check out this rather lovely vegetable garden. I first saw it when we went on a tour of Clarence House last year. In existence since 2004, this is HRH the Prince of Wales’ own vegetable garden, where he grows food for himself, his family and his guests. Totally organic, it includes carrots, parsnips, potatoes, lettuce, beetroot, cauliflowers, leeks and broad beans. The Prince of Wales also grows tomatoes, herbs and mulberries. There are so many things to see and do, it is well worth going along to the Garden Party To Make A Difference in the next few days if you are in the London area, but if not you can always check out the Start website for some fantastic ideas and inspiration on how you can incorporate small changes into your life that will make a big difference to the world’s future. With inspiration like this, now more than ever, it really is time to Start. I always love seeing creative reuse of materials. My two favorite you showed were the pallet house and the dresser garden. So creative! It sounds like a great event. Amazing that American pallet's could be the solution to the world's housing problems.